Upper 1/2 of 20 foot cypress tree turned completely brown. Live 30 miles north of Boston. Had record snowfalls this winter, and now the upper half of my Leyland Cypress trees are all brown. Can the trees be saved? What can I do to help the tree? 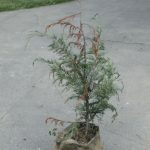 There is no treatment for winter damage on Leyland Cypress. With the subsequent damage that you have now had it's apparent that the tree was severely damaged. You can prune away the dead branches to about 1/4" of any green still left on branches. 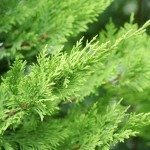 Leyland Cypress is very tolerant to heavy pruning but if more than 1/3 of the tree is damaged, it may need to be replaced. It was a very harsh winter that effected the majority of the United States.